Moving into my forties was kind of special. An awakening to know that being forty it ISN’T old. To think I’m probably half way through, hopefully not even half, I certainly now think more about what kind of life I want to be living when I am 80+. And that kind of life is no different to the life I am living now. Travelling the world, riding my Ducati, skydiving, trekking the world’s most amazing mountain ranges, scuba diving, exploring this amazing planet. Being in my forties also allows me to be the perfect example for other forty plus year olds and to show what IS possible. Maintain body percentage between 10-14% is easy when you know and understand how your body works, how it responds to different nutrition strategies and workout plans. I have found though, that it doesn’t require perfection. Just consistency in the right elements. There are a few metabolic changes that you do need to be aware of, and work within those changes for optimal results. Understanding the science behind results is crucial also. That goes for mindset, controlling your subconscious mind, being an unstoppable force and the science of nutrition, training and strategic lifestyle planning. These will all have a massively positive impact on your productivity, work performance, mental engagement in relationships, family, work, friendships. Each decade from the age of 30 we lose 3 -5 per cent of the muscle mass we naturally carry, which causes us to lose muscle function, performance and a slowing metabolism — a condition called sarcopenia. But this doesn’t mean you necessarily end up frail, Professor Fiatarone Singh said. “There are studies on men in their 70s who’d been lifting weight for 15 to 20 years and their muscles looked identical to that of 20-year-old men in terms of size and strength,” she said. Therefore it’s never too late to get started, even if you’ve never engaged in resistance or weight training before. “We have muscle biopsies of people over 100 years old and you can see changes in their muscle cells, even at that age,” Professor Fiatarone Singh said. Now that’s impressive. In another study. 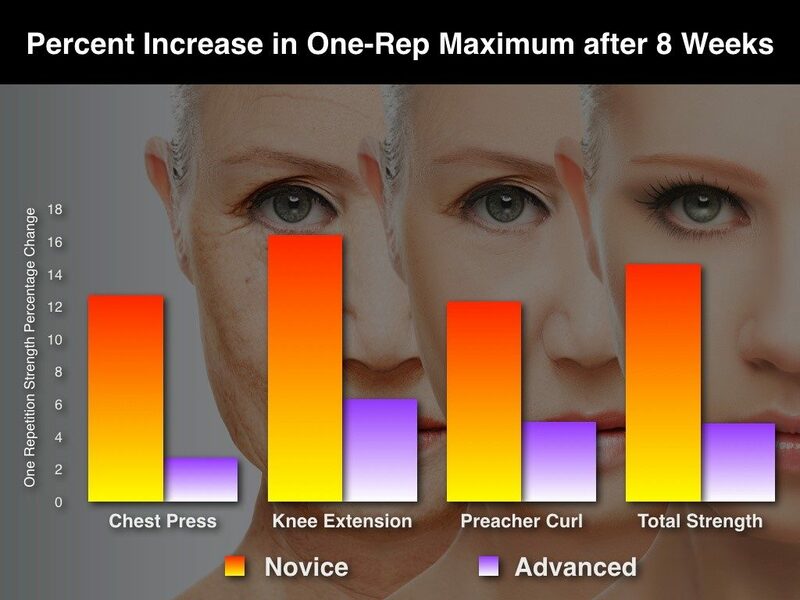 Of 60+ year old women participated in an eight week resistance and strength training program. Strength training just 3 times per week. For the novices, all strength gains were higher than the advanced group, yet all made improvements. In all strength groups, biomarkers (cholesterol, triglycerides, blood sugar) all reduced up to 15%-34. This is just one of many studies which continue to support the benefits of resistance and strength training. Many say, ‘life begins at 40.’ Life may not be as it used to be in the past. But it is not the end of the world. If you are over 40, if you want to get lean or stay lean, nutrition is king, and training needs to be strategic. I often ask my clients which has been their best decade of life, and everyone over the age of 40 says, their forties. I ask those over 50, and they say, their fifties! So, I guess that means life only gets better! So bottom line, make sure you are in good physical shape, and even more optimal mental state. You can still shed stubborn fat and increase your strength at any age. And nothing really changes from your earlier years. The most important would be to stay safe, work smart, not hard and heavy. Sure you will need to increase your resistance, work to your potential and produce force to get stronger, but you don’t have to do that overnight or a week. Be progressive. Here are 4 simple steps you can follow to be in your peak shape even in your forties. Make the commitment to change and be consistent. That means building an active lifestyle. You’re old enough now not to be telling yourself BS stories and excuses. You know it takes work. You know there are no short cuts and you know it is important to ensure you continue to live a long active and independent life. It’s not about motivation. It’s about GETTING IT DONE! So just do it! Lift weight and get stronger. Lift. That is, Lift heavy weights. All you need to do is lift to your potential 3 times per week, even 20 minutes is enough to maintain your testosterone levels. So don’t make the mistake you need to be in the gym for an hour 6 days per week. You don’t. The secret to independent and active aging is definitely strength, many studies reveal the benefits of strength training in maintaining independence, managing and preventing pain, maintaining healthy body fat levels and of course reducing the risk of heart disease and diabetes. This means eating a good range of natural whole foods, lean sources of protein, most of the time. Eat your eggs, get your beef. On this note of nutrition, it can be both super simply and overly complicated. I will always do my best to simplify all components, and yes we can get into your Basal Metabolic Rate (BMR), and Total Daily Energy Expenditure (TDEE), but I’ll leave those for future articles. Let’s keep it simple for now. Eat clean, whole foods most of the time. Commit to better sleep and recovery systems. As we age, sleep and recovery becomes even more important. This is when your body heals, repairs and rejuvenates to ensure you are working at your best on a daily basis. Your mindset needs to be clear, you need to be focused, creative, empowered and mentally unstoppable. IN addition, you will be rewarded with better skin, manage stress, always be in a happier mood, and stave off mood swings, maintain ‘peak’ positive state, stronger immune system, repair and heal your DNA, reduce risk of cancer and other lifestyle-related heart disease, improved metabolism and body composition, incredible motivation, productivity and performance on every level. If nothing else, just get more out of life! Who doesn’t want that? Daniel Remon is the CEO of Fitcorp Global Group. A 20+ year veteran of the health and fitness industry, he has pioneered corporate wellness, executive performance programs and result driven health, energy and business systems for today’s busy executive. Author and speaker, Daniel is the creator of the 28 Day Challenge, Fit in 15 for Women, Goal Setting for Life, 30 Day Rituals, 42 Formula, Corporate Wellness Blueprint – Solutions to maximize productivity, optimize performance and develop highly energized and engaged clients to achieve incredible success in business and life. The driving force behind his inspiration is the ultimate purpose to Impact One Million Lives.